Many who celebrate Christmas have a feast of fish on Christmas Eve. Others enjoy game birds or meats often served as the main component of Christmas Day dinner. Growing up, our family enjoyed both, as we celebrated both days. Christmas Eve was often a large poached or smoked salmon with plenty of hardy sides. Christmas Day we would slow roast game hens or other fowl while everyone lounged around admiring some gifts. Smoking a whole filet of salmon is relatively easy. When cooked through it can be served at room temperature as an appetizer on toasted baguette slices with some chopped onions and a squeeze of lemon. Or, serve it warm right out of the smoker as a main course. It is quite nutritious. You can find one of my smoked salmon recipes here. 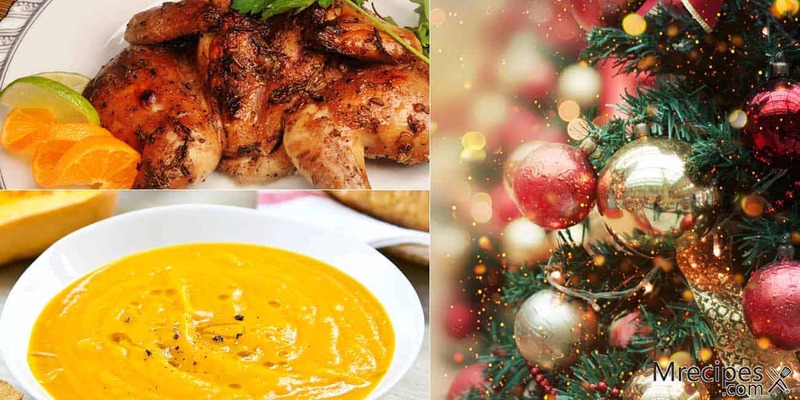 For this Christmas inspired meal, we are going to smoke some Cornish game hens on the Masterbuilt Electric Smoker, as well as some seasonal butternut squash. You might also want to smoke some Brussels sprouts to go along with the meal. For the sprouts, I recommend placing them in a microwave for just 3 minutes to soften, as they can become dry when smoked. A side of wild rice with pecans and dried cranberries will round out this meal. You can find a quite simple rice recipe here that can be made while the rest of your meal is in the smoker. I am not a huge fan of stuffing poultry. I tend to overcook my birds when stuffed out of fear that the stuffing might contain some raw poultry juices in the center. However, stuffing a small bird like a hen is generally pretty safe. My preference is to use fruit in the cavity of the hens. This gives them a nice flavor and imparts some additional moisture. This recipe will easily serve 8 people and probably more if you cut your hens into 4 pieces. 1. Rinse the hens and pat them dry with paper towels. Allow them to rest and come to room temperature, approximately 30 minutes. 2. Preheat the Masterbuilt smoker to 250˚F. Add wood chips to the tray and fill the water bowl half way. 3. Combine the EVOO with the seasonings. Using your hands or a pastry brush, rub the cavities and exteriors of the birds with this mixture. Stuff each bird with 3 orange quarters. Tie the legs together with butcher’s twine. Place the birds on the rack and tuck the wings under their backs. 4. Place the rack of hens in the middle of the smoker with a drip pan on the next rack down. Smoke for approximately 2-1/2 hours or until the internal temperature is 165˚F. You will have to check at 2 hours. You will also have to replenish the wood chips and water approximately every 45 minutes. 5. Remove the hens to 2 large cutting boards and tent with foil to rest 15 to 20 minutes. Cut in half, discard the oranges, and serve with your favorite holiday sides. (Recipe ideas follow). This recipe should serve 8 people as a side dish. 1. Preheat the smoker to 275˚F. (You can adjust the cooking time if smoking other items at lower or higher temperatures). 2. Slice the squash in half lengthwise. Scoop out the seeds. Rub the flesh with EVOO, maple syrup, and salt to coat evenly. 3. Place wood chips in the tray and fill the water bowl 1/2 way. 4. Place the squash halves flesh side up on the top grate of your smoker (not beneath your hens). Smoke for 2 to 3 hours. Check with a knife to see that the flesh is soft. Replenish the wood chips and water at 45 minute intervals. 5. Remove the flesh from the skin. You can either mash it or puree it in your food processor for a creamy side dish. Season with salt, pepper, and a little butter. You can add more syrup if you want it less savory. Use the freshest Brussels sprouts you can find. Old sprouts tend to be very dry and tough. You might be able to fit these next to, or on a rack just beneath, your squash. This recipe will serve 6 to 8 people. Sprouts go a long way. 1. Cut the Brussels sprouts in half lengthwise. Microwave the Brussels sprouts on high for 3 minutes in a glass bowl. Set this aside to cool for a few minutes. 3. Place all of the other ingredients in another bowl and whisk until mixed well. Add the Brussels sprouts and toss to coat. 4. Place the sprouts in an oven proof skillet, such as cast iron. It is okay if the skillet has sides because this will keep some moisture in the sprouts while smoking. Place the skillet on an upper rack of the smoker. Smoke until fork tender, approximately 2 hours. Check at 90 minutes. 5. Serve with your hens and squash. If you have the time, cook some bacon until crisp and crumble over your sprouts.